After a busy week spent traveling for work and a morning digging out from a surprise snowstorm, I had a great weekend with my family. It was Sunday night before I heated up the soldering iron and got down to business building the ProASIC 3 nano FPGA board. I started with the toughest component, the FPGA. Its central location and low height means …. I started with the toughest component, the FPGA. Its central location and low height means that I will have an easier time accessing it before other components are mounted. That is not likely to be a big problem for this board, with plenty of space around the chip, but I would still prefer not to have to work around the filter capacitors if I can avoid it. On the other hand, its 100 pins and 0.5 mm pin pitch makes it far and away the most difficult soldering job on the PCB. 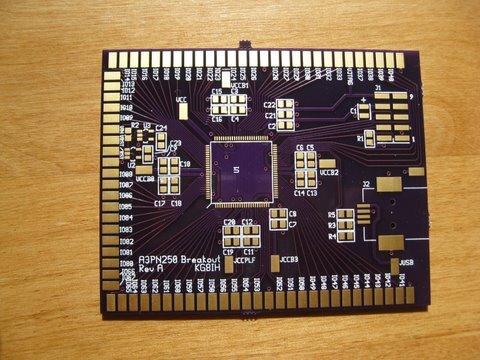 The FPGA boards are here… and they’re purple! Despite my last post mentioning the lateness of the breakout boards, it turns out they had already arrived. The mailer was stuck between two magazines in the mail, so my wife and I missed seeing it. I had hoped to get the PCBs by February 26. They were here the 22nd. Oops! They came out quite nicely, with no obvious defects, and they look quite regal with gold plating and Laen’s signature purple solder mask. How often do you see purple circuit boards? The gold is nice, too. Laen’s standard boards are have a solder finish, but sometimes some of his customers pay the extra for gold, in which case all the boards on that order come back with gold. The FPGA board, gleaming and ready for some solder. I’m looking forward to building up these boards and writing some Verilog to bring them to life. I had hoped to be able to write about the new printed circuit boards this weekend, and maybe even show one built up, but they didn’t arrive. I had guessed that it would take them 9 days to get to Ohio from Oregon, which would have made them arrive yesterday. There have been several snowstorms in areas they would be passing through, so it’s quite possible they were delayed by weather. I’m still working on getting the Actel Microsemi development environment set up at home. When I tried to register for a free license key, the web site was down for maintenance. I’m looking forward to getting it installed and starting work on some Verilog code. First up will be an iambic keyer. 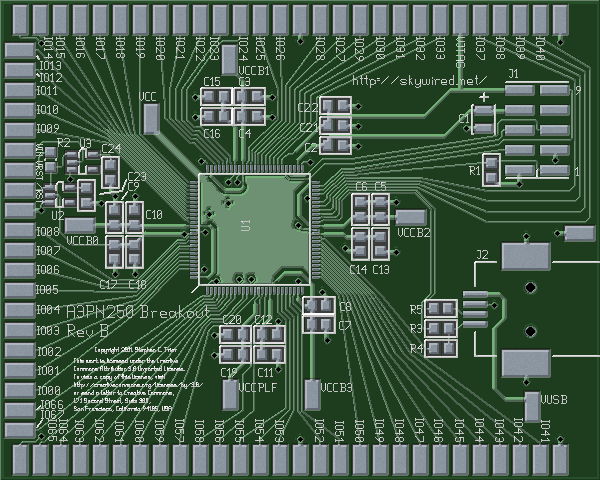 Here at last is the printed circuit board layout for the FPGA breakout board. I’m planning a series of projects involving FPGA-based DSP for ham radio, and in order to build them, I need an FPGA and a PCB on which to mount it…. Here at last is the printed circuit board layout for the FPGA breakout board. I’m planning a series of projects involving FPGA-based DSP for ham radio, and in order to build them, I need an FPGA and a PCB on which to mount it. In the last installment of the project, I presented the schematic for the breakout board. The goals for this layout constrained it to be a nearly single-sided layout, with a ground plane on the back. That way, the board could be mounted directly on a piece of copperclad with no short circuits to ground. My budget limited me to a double-sided board, so all signal and power traces had to go on the top side. That said, here is the layout, top and bottom. Yay! Now we’re getting somewhere! 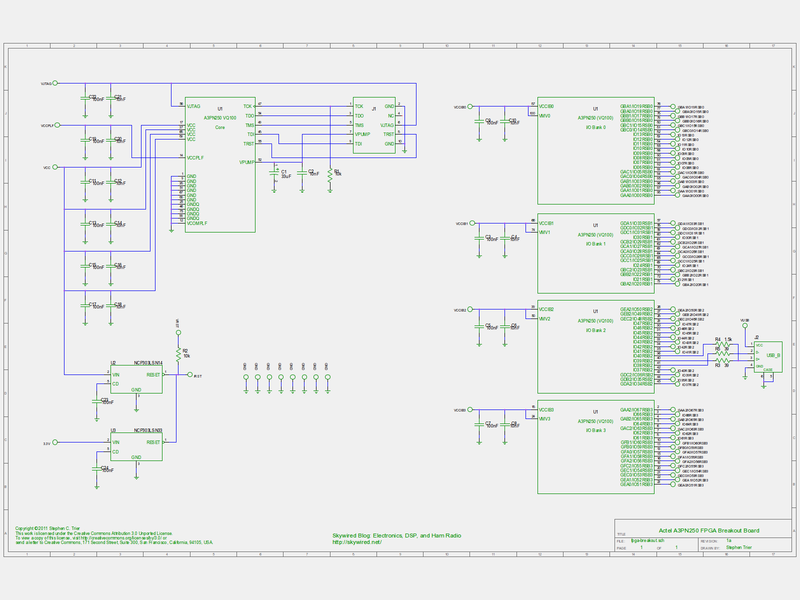 Here is the schematic for the FPGA adapter. Here is the schematic for the FPGA breakout board. To get to my goal of a DSP-based ham radio using an FPGA as the DSP, I first need a way to prototype with an FPGA. Available FPGAs all use modern, small packages such as QFNs, QFPs, and BGAs. I can’t imagine soldering wires directly to a hundred tiny pins, so “dead-bug” construction, with the chip upside-down on a piece of copperclad board, is out. I need a breakout PCB that holds the chip and brings out its pins to something more reasonable to work with.